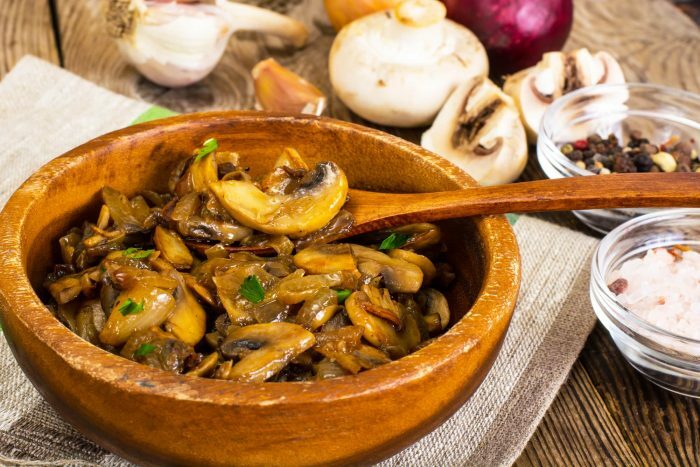 Mushroom trifolati, or funghi trifolati, or simply sauteed mushrooms is a common side dish throughout Italy. The name translates literally to “truffled mushrooms,” because the sauteed mushrooms in this dish so closely resemble truffles. I used a variety of wild mushrooms—porcini (if you are in abundance you can also check our risotto with porcini mushrooms recipe), oyster, and cremini, but you can use whatever mushrooms that are fresh and in season, then just sauté with garlic, olive oil, parsley and some spicy peperoncino flakes. 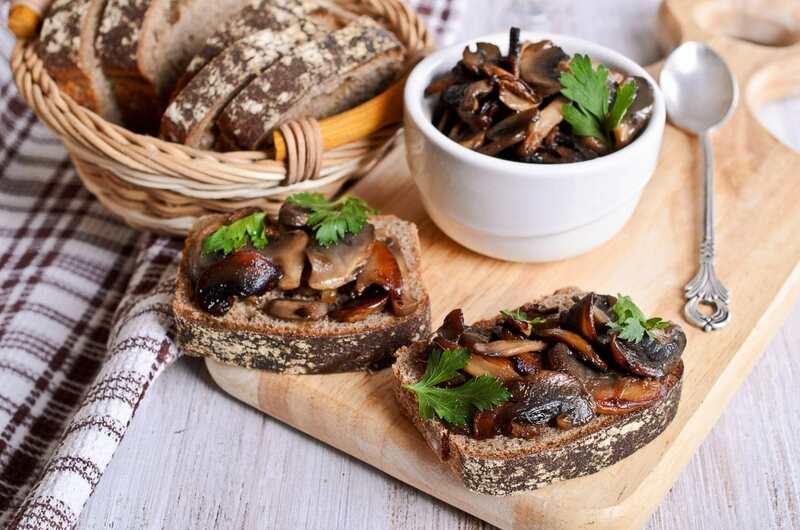 The addition of homemade, thick-cut potato chips for scooping the medley of mushrooms in bite-sized portions makes this recipe an excellent appetizer. 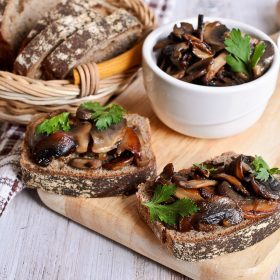 In addition, mushroom trifolati could also be served as a crostini or over pasta, gnocchi, or on top of a creamy polenta dish. Whether you are looking for a side dish or an appetizer, this recipe is perfect for you! Slice the potatoes into 1/8-inch slices using a mandoline. Soak the sliced potatoes in a large bowl water. Transfer to a clean kitchen towel and pat them dry. Brush each slice with olive oil, then gently bend and fit into a muffin pan. Add salt and pepper to taste and bake at 425º for 25 minutes. Finely slice the oyster and cremini mushrooms lengthwise. Set aside. Soak the porcini mushrooms for 30 minutes in very hot water until reconstituted. Drain and rinse the porcini mushrooms in a colander to clean any remaining grit. Set aside. In a large skillet, heat 4 tablespoons of extra-virgin olive oil over medium heat. Add the garlic and sauté until fragrant, about 1 minute. Add the porcini mushrooms and sauté for 1 minute. Add the rest of the mushrooms, 1/8 cup of the parsley, chili flakes and salt and pepper to taste. Cook for 15 to 20 minutes or until tender. 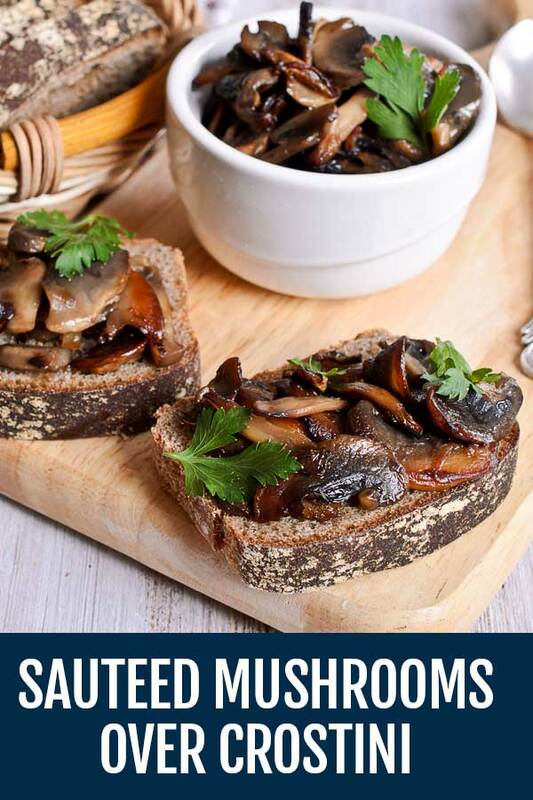 Scoop the mushrooms into the center of a platter and top with the remaining parsley. Arrange the chips around the edge of the platter.